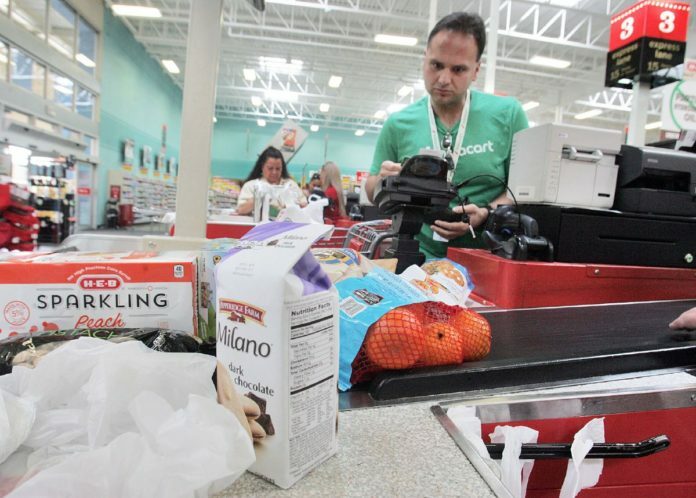 Instacart shopper Richard Martinez checks out groceries at H.E.B. on Col. Rowe Blvd. April 27, 2017 in McAllen. McALLEN – A grocery delivery service has arrived in the Valley and is already taking orders. Instacart, a San Francisco-based company founded in 2012, aims at making shopping more convenient by having someone do all the shopping for you. The company partners with local grocery stores to allow customers to place orders through their website or mobile app. Personal shoppers will then go to those stores for them and deliver them to the customer in as little as two hours. Customers can also select to have their groceries delivered during a specific time slot, according to Jessica Murdock, Houston and Dallas Area Manager. Typically, they charge 5.99 per delivery but they are running a free-trial of their Instacart Express membership for an entire year which gives customers unlimited free deliveries for orders over $35. The annual fee for the membership is usually $149.99, or 14.99 per month. The service is already available in over 40 markets around the country but as of Thursday it became available in 52 zip codes in the Rio Grande Valley. To find out if the service is available in their area, customers can log onto the website, instacart.com, or mobile app and enter their zip code. The company has hired about 50 personal shoppers from the community for the launch. Murdock assured they are trained to select the highest quality produce and to pay attention to expiration dates. However, if there are any issues with the order or service, they have what they call a customer happiness help line available. Making their expansion into the Valley possible was the company’s existing partnerships with H-E-B, Petco, and Costco. Their partnership with Costco allows even non-members to shop from there. H-E-B already partners with Instacart in the San Antonio, Austin, and Houston area. Berenice Garcia covers Western Hidalgo County and Starr County for The Monitor. She can be reached at bereniceg@themonitor.com or (956) 683-4432.